I woke up to a beautiful Labor Day morning in Oregon of blue skies and the wonderful sound of the river coming through my window. This was going to be an awesome day for an afternoon hike for the first week in September here in Oregon. I need to get the Pioneer Woman’s Spicy Dr. Pepper Shredded Pork I made last week from the freezer into the crock pot to heat up. I made a big batch so my son Scott could take some down to the Hoodland Fire department were he is a volunteer. After a little work around the house the pork was ready to send with Scott keeping back some for sandwiches after the hike. If you live in the Pacific Northwest you know that the Pacific Crest Trail runs from Canada to Mexico. We are lucky enough to live right down the road from were you can jump onto the trail. John and I loaded Sage in the car for a small afternoon hike, with this being Sage’s first hike. 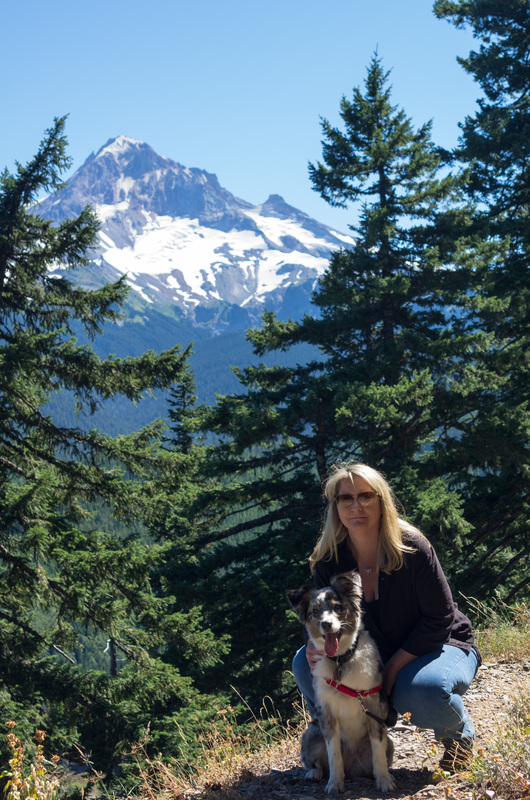 We took the trail towards the south which gave us a great view of Mt Hood and then walked 20 feet and had a view of Mt Adams, which is located in the state of Washington. 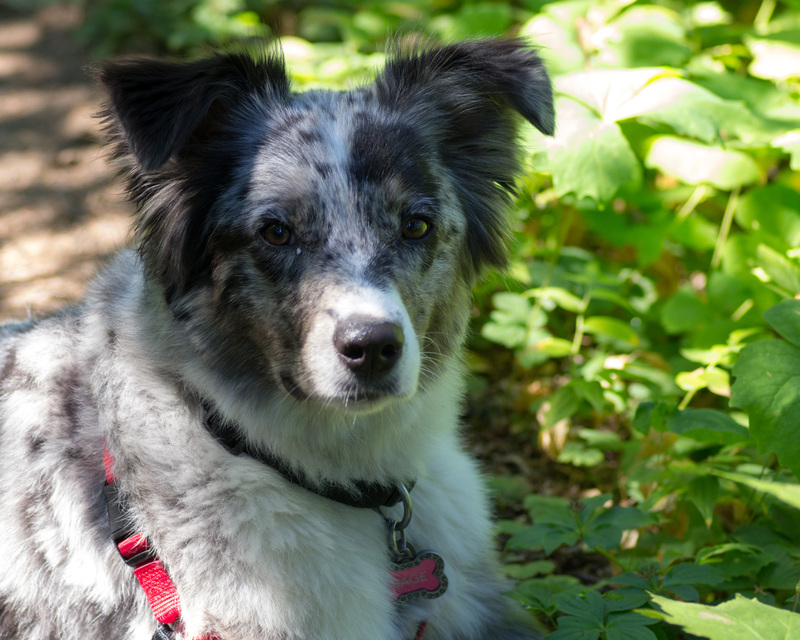 We had a great afternoon hike and found a patch of huckleberries along the way. Check out tomorrow’s post to see what I am making John and Scott with the huckleberries we picked. After returning from our hike we were ready to eat and instead of making the traditional coleslaw with cabbage to go with the pork I decided to make some apple slaw. 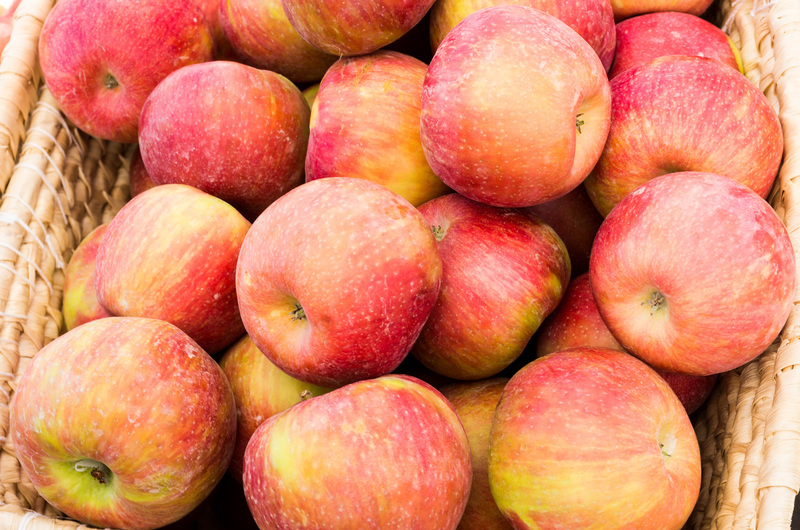 I had bought some Honey Crisp apples, that just came into season, at the farmers market on Saturday. I hope you all had a wonderful Labor Day! Happy 1st Wedding Anniversary to my son and daughter-in-law, Johnny & Jess! Fill a medium bowl with water and add a tablespoon of lemon juice. 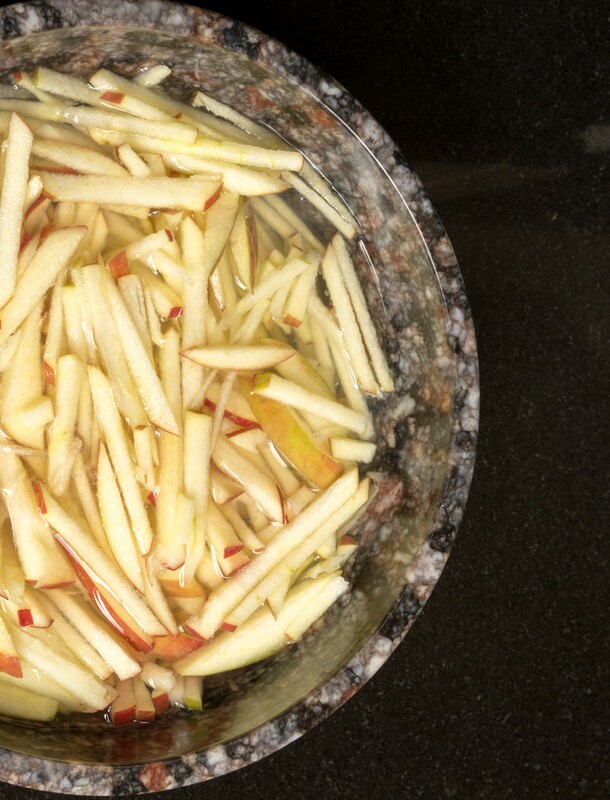 Cut apples with skin on (looks prettier) into matchstick size pieces and place into lemon water to prevent browning. In small bowl combine Miracle Whip, sugar, vinegar, salt and pepper and whisk to combine. 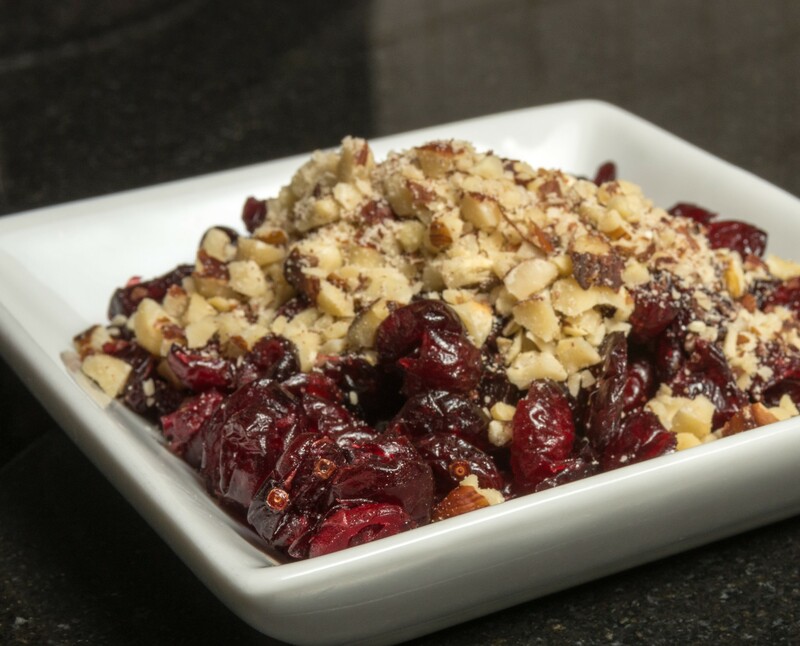 Drain water from apples and add the cranberries and hazelnuts. If you do not have hazelnut (which is the state nut of Oregon) you can use pecans or walnuts. Toss with the Miracle Whip mixture until coated. I added a side of my Bread & Butter pickles to finish off the meal. Carrie, my family LOVES the PW Spicy Pulled Pork, huge hit here. 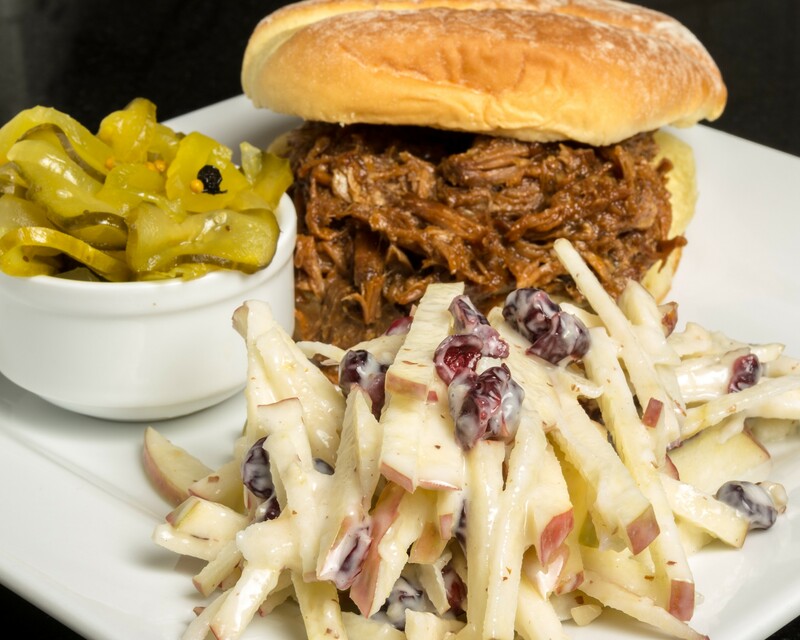 The slaw looks good, I’ll have to try that with the sandwiches– looks like a good combo. And I can’t believe Jessica and John have been married a year already. Time is just flying by. Awesome you made the pork. I make about every two week and then put in small freezer container and pull out for lunch during the week. The apple slaw I made we were still eating three days later the apples were still crisp and the dressing was still perfect. Thank so much for the comment.